My daughter spends a great deal of her time and money in Victoria’s Secret and VS Pink Store. I decided about 8 months ago exactly what type of cake I wanted to make her for her birthday in March. I told her that I knew what cake I was going to make and how cool it was going to be, she was going to love it, and I was keeping it a secret. She was definitely curious. She would ask “what is this secret cake you’re going to make”? I had to laugh, because a “secret” it was! So it is now the day before the party, I am nervous. 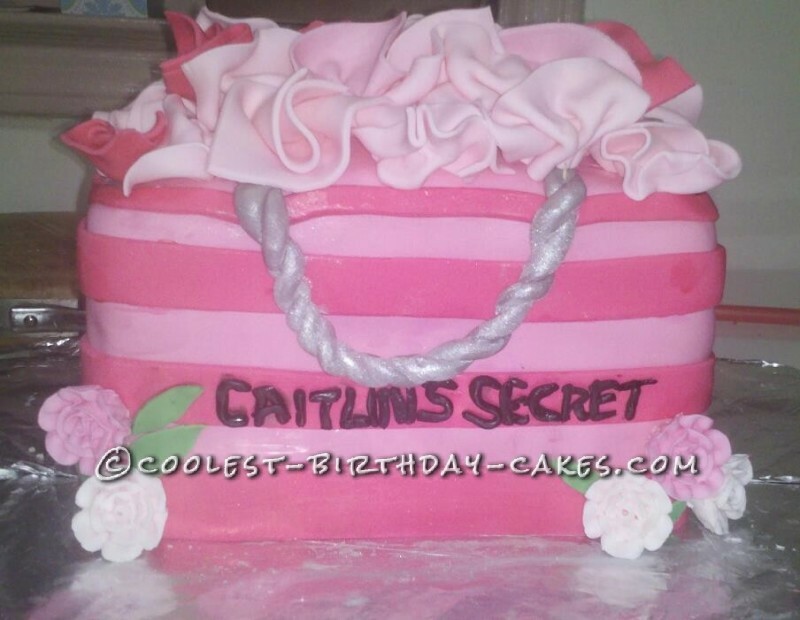 I talked up this Victoria Secret birthday cake so much, now I had to deliver! YIKES!! Thankfully, all went pretty smooth. My cake was vanilla flavored with homemade butter cream frosting. I then made Marshmallow Fondant, which is super easy to make, three simple ingredients, marshmallows, confectioner’s sugar, and water! I used to buy the pre-made fondant (which can be expensive and does not taste as good as MMF). I like to add the color (Wilton’s color paste) to the melted marshmallows before mixing with the sugar, I find it easier to blend in the color that way. I rolled out my fondant, was able to get it on the cake smoothly. I then cut out my stripes, brushed a little water on the back to help adhere them to the fondant on the cake. Now it was time to make the tissue paper. I cut out squares of fondant, fanned them and just placed them on the top of the cake, I was happy with the way they came out, it really looked like tissue paper!! 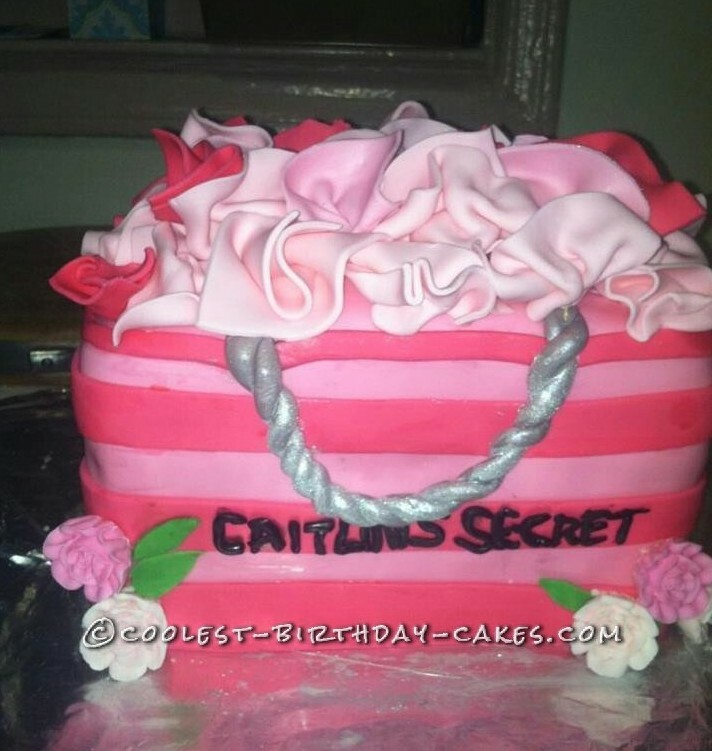 I added a couple of flowers, added the lettering “CAITLIN’S SECRET”. I was done!! I made it through without any mishaps. Day of the party: My daughter loved the cake, as did all the guests. No one wanted to cut into it…..(ruin it), but ruin it we did, and it was delicious!